Designed by architect Hames Sharley, Marina East brings an acclaimed level of waterfront design and fit-out to the only marina east of Perth and is billed by Blackburne as the first high-end apartment development directly fronting a marina near Perth Stadium and Crown Perth. The 91-apartment project, which will sit across three boutique-sized buildings, attracted unprecedented interest from all market demographics at the launch of stage one last year. Blackburne Founder and Managing Director Paul Blackburne told West Real Estate he expected a similar response with today’s launch. “Over $28 million worth of apartments sold at the launch of stage one and we expect the remaining apartments to sell soon after the launch of stage two this week,” he said. “The amazing thing to see in this project has been the diversity of buyer types. We have seen everything from baby boomer downsizers to investors and young professionals. “Downsizers are buying as there are no other waterfront marina apartments at affordable prices in the east and the area provides an amazing lifestyle change. Making the most of Marina East’s location, almost every apartment boasts water views, with the complex designed to maximise access to natural light and river breezes. More than $2 million has been spent on common facilities, including outdoor barbecue dining areas, gardens, a gym and sauna, a yoga studio, a vibrant 230sqm ground-floor alfresco cafe and stand-up paddleboards and kayaks which allow residents to make the most of their serene surrounds. “There is a stunning nature reserve just outside the marina which people can walk around or paddle over to,” Mr Blackburne said. The project is nearby some of Perth’s biggest drawcards, including the stadium and Crown, Elizabeth Quay and the CBD, as well as Ascot Racecourse, Maylands Peninsula Golf Course and dozens of parks and scenic spots along the way. Apartments come in sizes and prices to suit all buyers, with one-bedroom options available from $395,000, two bedrooms from $595,000, three bedrooms from $695,000 and penthouses from $1.02 million. Apartments will include high-quality fixtures and finishes, including freestanding baths, and designer timber flooring. 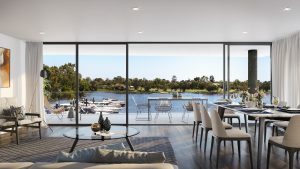 Mr Blackburne said Marina East offered a luxury lifestyle alternative to the western suburbs. “There is almost no supply of high-end waterfront apartments in the western suburbs, and if you do find one, the price is around $400,000 higher than at Marina East,” he said. “People are looking for alternative options without skimping on quality, lifestyle opportunities and accessibility to amenity. Construction starts on Marina East in June and will finish in December 2019. An onsite sales display and viewing tower are open 11am-2pm on weekends or by appointment at 16 Marina Drive, Ascot Waters. Contact Blackburne | 9429 5789 | www.marinaeast.com.au.